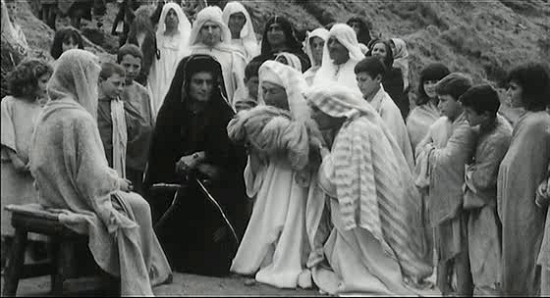 Remarkable in its use of cinema verity to obtain a sense of dynamic immediacy, this 1964 film by avowed Marxist and atheist/Catholic Pier Paolo Pasolini (Teorema, Salo) sticks closely to the biblical story of Christ from the Annunciation to the Resurrection. Pasolini uses a complex but seemingly stark and simple visual style, and he evokes wonderful performances from nonprofessionals to produce his greatest work. The Gospel According to St. Matthew marks an important shift away from the gritty urban realism of Pasolini's earlier films towards the visionary imagery of his later work. A committed but far from conformist Marxist, Pasolini took a powerful and immediate approach, with no false piety or sentimentality. Employing a cast drawn largely from the peasantry of Southern Italy, where the film was shot, the action has the feel of a mystery play reenacted for the camera. Enrique Irazoqui's Christ is part folk hero, part political agitator, but always pursuing his destiny with unswerving conviction. The disciples make for vivid contrasts in facial expression, while Susanna Pasolini (mother of Jesus) is unforgettable as Mary, distraught at the Crucifixion. The recourse to handheld cameras and zoom sequences is well ahead of its time, while the almost jump-cut editing and diverse soundtrack - including Bach, Mozart and the Missa Luba - enhance the sense of action being experienced as it happens. This is indeed a classic of post-war cinema which has lost none of its urgent humanity. Though the film is about religion, it is more than a religious film as Pasolini's classic still pleasures and provokes in equal measure. The film is essentially a ‘straight’ retelling of the life of Christ (who is played with fervent intensity by Enrique Irazoqui), which, on its surface, seldom editorializes or strays towards controversy, the film was fully embraced by the religious community to the extent that a colorized version was made to capitalize on the Bible belt buck. 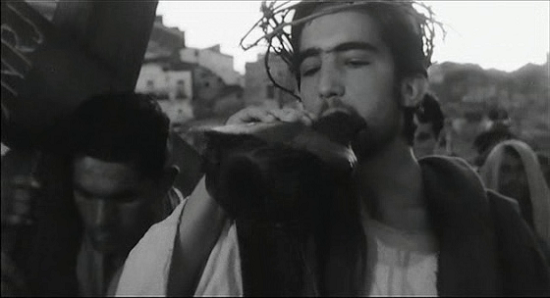 General familiarity of with the text makes this one of Pasolini’s most easily approachable films, as we’re given a Jesus Greatest Hits package which covers everything from Herod’s violent purging of first borns via the loaves and fishes, walking on water and through to Christ’s death by crucifixion. While the passionate sincerity of the delivery initially makes you wonder why Pasolini should change his tack so completely, the anachronistic tics and subtleties of the filmmaking offer room for deeper consideration. Eclectic, albeit carefully chosen soundtrack selections emphasize the geographic and temporal reach of the material, as Bach’s ‘Mass in B Minor’ segues into Odetta’s wailing blues number, ‘Sometimes I Feel Like a Motherless Child’ and the film even opens with Congolese tribal music. It’s a small but piercing touch, reminding the viewer that we can’t consider the biography of Christ without taking into account the specific time and place in which the events purportedly occurred. 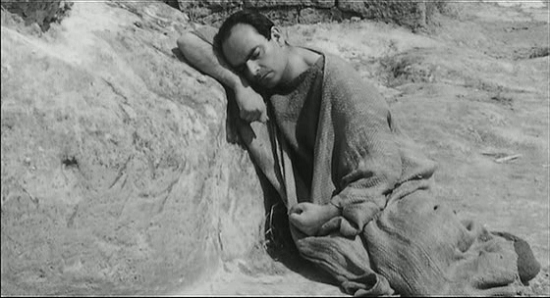 Yet, while he creates a disconnect with the music, the busy, mobile shooting style successfully transplants the emotive precepts of Italian neorealism back to the Biblical era. One thing that connects all of Pasolini’s films is the unflinching way he photographs faces and bodies, finding a tremendous, grotesque beauty in the extras and supporting cast, displaying an almost Christ-like empathy towards all of God’s creations. The Gospel According to St Matthew earns its sense of sublime by placing Jesus’s acts of hocus pocus into real landscapes containing real buildings and populated by real people. Indeed, this is as much about the appeal of religion to the poverty-stricken masses as it is about the revolutionary zeal of Jesus himself. The works of directors like Robert Bresson, Carl Dreyer, Bruno Dumont and Terrence Malick (to name a few) raises questions concerning the difference between 'religious' and 'spiritual' cinema. Do these filmmakers produce work that decries the teachings and standards of religion, or are they using the context of theology to examine something more universal and untenable? Even though Pasolini’s film offers traditional religious nourishment aplenty, there is still the sense that he’s delicately manipulating the material to mine a more sophisticated seam. The manner in which he films the actual miracles is fascinating: they all occur very suddenly with a single cut. Not only is he happy to accept that Jesus was able to perform physical miracles, he also makes a point about cinema. For Pasolini, every cut is a potential miracle. 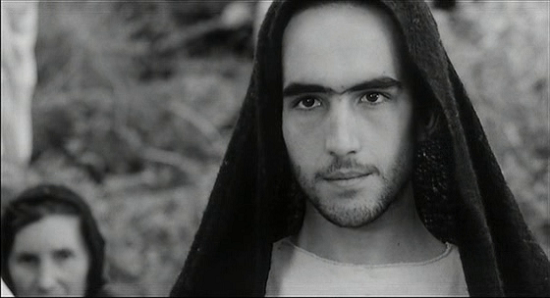 With its stunning black-and-white photography, an eclectic soundtrack (Odetta, Bach, a Congolese mass, etc), and a cast of non-professionals who voice dialogue drawn directly from scripture, The Gospel According to Matthew certainly depicts the key events in the life of Christ, from immaculate conception to death on the cross.Vaunted by the Vatican as one of its select few recommended films, acclaimed by the Archbishop of Canterbury as a "great film", and revered by critics and audiences alike, it still remains a magnificent, awe-inspiring experience.